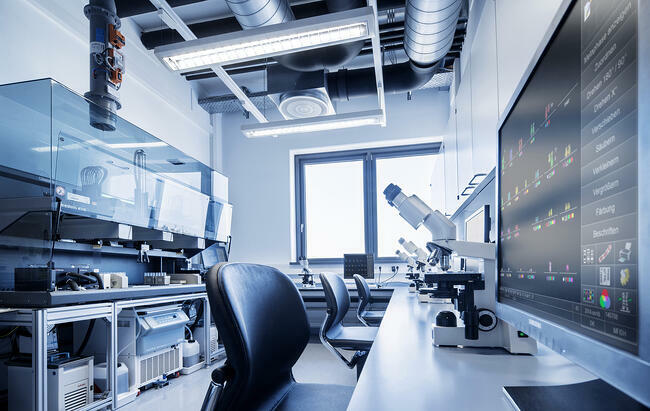 With an ever-increasing workload, Germany’s Munich Leukemia Laboratory has automated its cytogenetics protocols on five Freedom EVO® workstations, enabling leaner, standardized, more efficient processing and minimizing the potential for human errors. The Munich Leukemia Laboratory (MLL) provides a comprehensive range of diagnostic tests to hospitals and doctors across the country, offering cytogenetics and fluorescence in situ hybridization (FISH), molecular genetics, cytomorphology and immunophenotyping services. The laboratory continually refines and streamlines its procedures to cope with growing sample numbers, and automation plays a key role in this, creating standardized, efficient procedures and minimizing the potential for human errors. MLL uses its Freedom EVO platforms to improve efficiency and save time compared to manual processes. MLL has established automated Sanger and next generation sequencing protocols for molecular analysis, performing semi-automated isolation of mononuclear cells by Ficoll separation on Freedom EVO workstations, followed by RNA and DNA preparation on a Roche MagNA Pure™ 96 System and PCR set-up on additional Freedom EVOs. In addition, automation of the key stages of the laboratory’s tumor-based cytogenetics and FISH workflows has been implemented on its Freedom EVO workstations, tailoring each individual system to a specific stage of the process, such as hypotonic and fixation treatment of cell cultures for chromosome banding analysis or the pipetting of fixed cell suspension drops or various FISH probes onto slides. Each platform is equipped with a Liquid Handling Arm and/or a Robotic Manipulator Arm, as well as any additional integrated modules required for its particular step of the workflow. After slide generation on the Freedom EVO systems and hybridization, FISH analysis is carried out using fully automated MetaCyte (MetaSystems) microscopy systems, with electronic sample tracking via barcodes. Prof Haferlach continued: “Some years ago, all our cytogenetics and FISH workflows were performed manually. We wanted to automate these processes, improving efficiency, saving time for our technicians and allowing unattended overnight processing. No matter how good your workflows and staff are, mistakes happen. Automation will always be more reproducible, generating better quality results than manual procedures; there is far less risk of processing errors. It also has the advantage of relieving staff of tedious, repetitive manual work, leaving them free to carry out other more stimulating tasks such as research and the implementation of new technologies." We are really satisfied with the Freedom EVO systems, which help us meet turnaround times and provide a high quality, cost-effective diagnostic service. “Quality is crucial, and whenever we invest in new technology we evaluate a number of companies working in that field, choosing the one that performs the best. We selected Tecan for the performance of its instruments and its excellent quality assurance system and, after discussing the best way to transfer our existing manual processes onto the Freedom EVO, worked with the company to automate our procedures. Having a good working relationship with your supplier is invaluable, as this is a two-way process requiring input from both sides; the laboratory needs to explain exactly what it would like the system to do, while the supplier has an in-depth knowledge of the instrument’s capabilities and knows how best to implement the necessary procedures on the workstations. Tecan listened to us, took our comments on board, and used its knowledge to tailor the Freedom EVO systems to our workflow. We are really satisfied with the systems, which help us meet turnaround times and provide a high quality, cost-effective diagnostic service. Collaborating with Tecan was good; you certainly notice the difference when you work with skilled people,” concluded Prof Haferlach.